Aw geeze.. broke my glasses.. AGAIN. I think it's just the nerd in me, wanting to be a super nerd, with taped up glasses and such.. because that's what I ended up doing, taping them back together. I was such a stereotypical nerd in junior high. Every picture of me had a noticeable double chin. Not only did I have huge ugly glasses, I also had braces; but not normal braces.. No, normal braces are not nearly nerdy enough. My braces had a crazy hook deal on one side that I had to put a rubber band on and attach to one of my molars. It looked like an insane hook fang. Also I was in the school band. 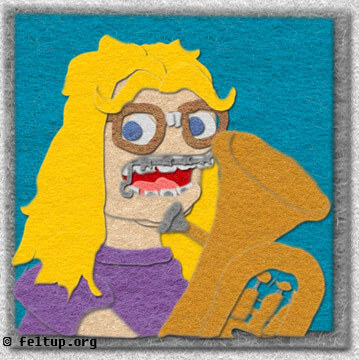 At first I played trumpet, but after I had the braces installed I found the mouth piece way too small so I was switched to baritone.